Like many angry teenage idiots, I read “Howl” and it turned me into a poet. When I saw it was published by City Lights, I made it my mission to someday get there. When I first walked into the bookstore in North Beach, I felt like a pilgrim finally reaching Mecca. One of my favorite moments as an author was doing my first event there. Thus, I became a friend of City Lights. When they publish something they think I’d like, they send it to me. This book blew the top off my head, and I feel lucky enough to be in the position to pick the big brain of Roy Scranton. To read on the Huffington Post, click here. 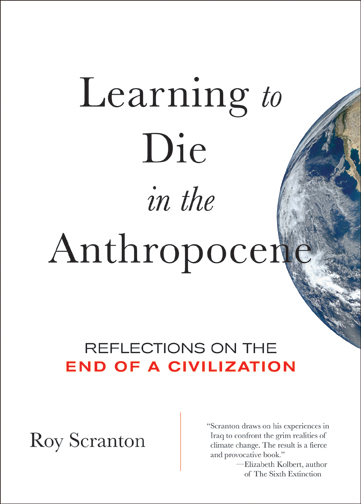 David Henry Sterry: Your book Learning to Die in the Anthropocene is in many ways about how the world is changing in dangerous, often horrifying ways. I’m curious how you see this in relationship to the attacks in Paris, in Nigeria, the beheadings, and acts of both sophisticated and crude barbarism which seem to be sweeping the globe at the moment. Roy Scranton: The word “barbarism” comes from the ancient Greeks. They used the word “barbaros” to distinguish foreigners from citizens, partly by mocking the sound of foreign speech: “barbarbarbarbar.” That’s what I hear every time someone calls ISIS barbaric: not an empirical observation, but an atavistic political judgment about who belongs to the West and who doesn’t. On an empirical level, of course, there is a very clear connection between climate change, the worst drought the Middle East has seen in modern history, the Syrian Civil War, the rise of ISIS, and the flood of refugees fleeing the region. Similar to what happened when the U.S. disbanded the Iraqi Army following the 2003 invasion, the devastation of agriculture in Syria (partly climatological, partly a result of Assad’s policies) created an army of jobless, hopeless, angry young men. The U.S. Department of Defense has called climate change a “threat multiplier,” but it is also a threat driver: the ramifications of catastrophic climate change are not only going to exacerbate existing conflicts, but are going to create whole new ones. On the cultural level, fear, scarcity, and instability are going to drive people to increasingly violent extremes. Trump and ISIS are two sides of the same evil, two manifestations of the same fear-driven race to hatred. DHS: As a soldier, an American, and a citizen of the world, what do you think we can do about this problem from both a macro and micro perspective? RS: At the macro level, agents are usually trapped within not only institutional norms but also by their own internalized limitations. At the micro level, most of us are too busy trying to pay our credit card bills to do much about anything at all. We’re in a very dangerous time, and all the forces at work are pulling us deeper into the danger. The best that we can do is interrupt the cycles of fear and hatred, create more opportunities for compassionate reflection, and learn to accept our mortality. We need to learn to die. DHS: I read somewhere recently that a writer was trying to make a connection between fundamentalist terrorism and climate change. Do you see that? RS: Yes. There is a clear connection. DHS: Why do you think Western civilization seems so cavalier about the way it is destroying the Earth? And again, what do you think is to be done? RS: I don’t think we’re cavalier about it, I think we’re schizophrenic. Western Europe and the United State have come to dominate the Earth in the past two hundred years through genocide, violent resource extraction, and fossil-fueled technological innovation. These practices worked really well to put “white” Westerners on top, and there is a powerful cultural inertia that tells us that we should just keep doing more of the same, even if that very strategy seems likely to end in catastrophe. Nevertheless, we’re not completely suicidal. Western civilization faced the moral horror of genocide when genocide was turned against part of Western civilization itself in the Holocaust, and we’ve been struggling with the consequences of violent resource extraction since the 1960s. Only in the past thirty years have we begun to realize that fossil-fueled industrialization is going to kill us. So on the one hand we have long-term, foundational cultural practices and beliefs, and on the other an empirical awareness founded in scientific observation. Add to that the immense power that we have access to through carbon-fueled technology (flying, iPhones, drones), and the immense pleasure that power provides, and our collective schizophrenia about climate change seems to make even more sense. Sadly, I think our conscious ability to deal with the problem has lagged fatally behind the opportunity we had for arresting climatic feedbacks before they spin out of control. Now I think the best we can do is adapt, dampen the worst effects, and try to keep the Earth from turning into a Venusian hothouse. But even to do that, we need to decarbonize the global economy immediately. DHS: Your description of the hell on earth that was Baghdad when you entered it in the early 2000s is absolutely harrowing. To what degree do you believe we have brought the extreme violence and chaos in the Middle East upon ourselves? RS: The United States and Europe have been meddling in the Middle East for more than a hundred years, bombing, funding assassinations, backing tyrants such as Saddam Hussein, eviscerating populist democratic movements, and supporting fundamentalist regimes like the royal house of Saud. Largely, of course, this has to do with oil. We have been spilling blood in the region for decades. Is it any surprise that we’re reaping the violence we’ve sown? DHS: Your book is filled with such beautiful writing. I was really struck by this line: “Carbon-fueled capitalism is a zombie system, voracious but sterile.” Could you unpack that for us? RS: Carbon-fueled capitalism–by which I mean capitalism that runs on extracted coal, oil, and natural gas–is a kind of social organization that consumes large amounts of energy but doesn’t feed that energy back into the global ecosystem in productive ways. It is parasitic to the Earth. What’s more, it’s already dead, though it doesn’t seem to know it yet. DHS: There are also so many wonderful quotes from so many brilliant and diverse minds in your book. I particularly liked your selection from the eighteenth-century samurai manual Hagakure: “Meditation on inevitable death should be performed daily.” We in the West seem to have such a horrible relationship with death. How did you find being a soldier affected your relationship with dying, and what have you taken with you from that into your civilian life? RS: Being a soldier in Baghdad didn’t offer any kind of mystical experience or transcendental wisdom. What it did was challenge me to confront my own mortality, a confrontation I could have had the privilege to avoid for many more years as a white male living in the early 21st century United States. But that challenge is one we all must face sooner or later. DHS: What exactly do you mean by the term “Anthropocene”? RS: The Anthropocene is a term some geologists have floated to describe the fact that the Earth has entered a new geological era, one characterized by the advent of the human species as a geological force. Thinkers and intellectuals have picked up the term as a rough synonym for climate change. The Anthropocene is a way to name the world we live in today, a world in which climate change is the single most important fact of our existence. DHS: Have you been following the presidential candidates’ debates? What is your take on them from an Anthropocenic point of view? RS: I’m very pessimistic about American electoral politics. By and large, the players at the electoral level are symptoms rather than agents; national policy is largely determined by bureaucracies and the corporate oligarchy. The only candidate who has offered a consistently responsible point of view on climate change has been Bernie Sanders, and we all understand very well that his chances of being validated by the establishment powers are practically zero. DHS: You quote from the Bible in your book. What is your take on organized religion and its relationship to violence and repression as well as kindness and generosity? RS: Organized religion is like any other institutionalized social structure, which is to say that it operates through a complex mix of inertia, individual ambitions, ideology, political relations to other institutions, and dependence on the group it serves. I quote the Bible for the same reason I quote the Bhagavad-Gita, the Epic of Gilgamesh, and James Baldwin: they’re all part of a rich, polyphonic tradition of human wisdom that can help us learn to live our transient, mortal lives with compassion and grace. DHS: What do you want the reader to take away from your book? RS: A sense of peace. 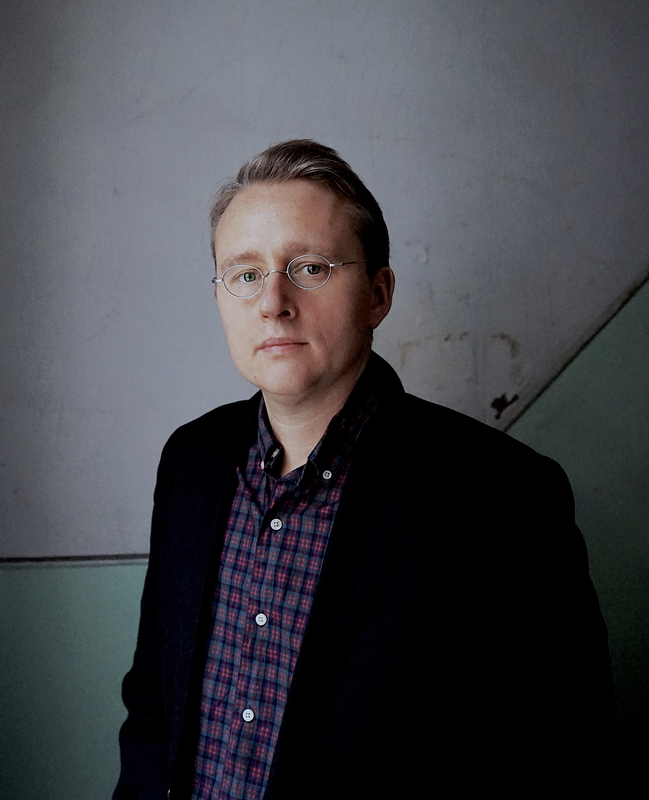 Author, journalist, Iraq war veteran, and Princeton Ph.D candidate, Roy Scranton’s journalism, essays, and reviews have appeared in the New York Times, Rolling Stone, Boston Review, Contemporary Literature, and elsewhere. He has been interviewed by many media outlets, including NPR’s Fresh Air with Terry Gross.